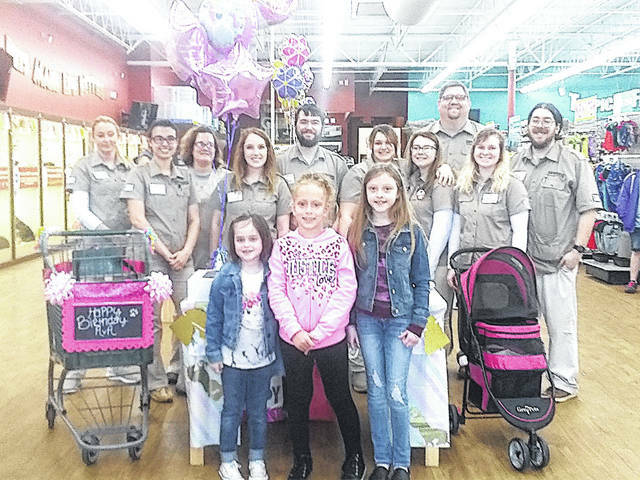 Petland in Chillicothe held a fundraiser last weekend for Greenfield third grade Ava Everhart (on left in front) presenting her with a new puppy and other gifts. Over the weekend Petland in Chillicothe held a fundraiser for Ava Everhart, a third grader at Greenfield Elementary who has cystic fibrosis. Everhart and her sister Zoie created a dream list that the family wanted to try and fulfill while Ava is young and as healthy as possible. Anna’s fundraiser in Greenfield will be held from noon to 11 p.m. Saturday, April 6 at the Greenfield VFW Ranch, 12868 Watt Rd. Submitted by Jean Little, Greenfield Elementary teacher.